An easy, high-protein breakfast recipe for almond joy overnight oats, perfect for meal prep and quick meals! Loaded with almonds, coconut flakes, and sugar free chocolate chips, this refrigerator oatmeal is completely vegan and gluten-free! Comes with a paleo and keto option too. It’s no secret that oatmeal is one of my favorite healthy breakfasts. It’s a blank canvas and can take many forms, including protein oatmeal, cookie dough overnight oats and my favorite carrot cake oatmeal. I have a new favorite now…Almond Joy Overnight Oats! This almond joy oatmeal recipe is literally dessert for breakfast. 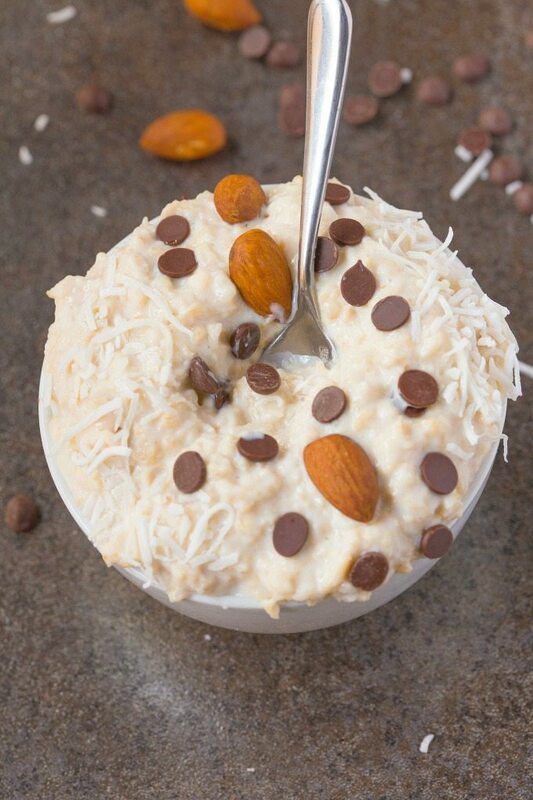 Smooth, creamy and hearty oatmeal, loaded with shredded coconut, chocolate chips, and crushed almonds. It’s secretly healthy, boasting a whopping 25 grams of protein and keeps you satisfied for hours. Whether you enjoy it piping hot or refrigerator style, it will be on your breakfast meal prep rotation. 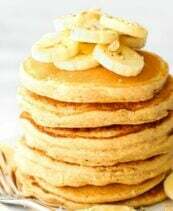 Not only is the base recipe completely vegan, dairy free and gluten free, but it also comes with an option for my paleo and keto readers out there, using my keto oatmeal base! Rolled oats are the best kind of oats to use, as they absorb the liquid the best, and have a hearty and chewy texture. You can substitute it for quick oats but only do so if you prefer smoother oatmeal. If you cannot tolerate oats, quinoa flakes are a great substitution, but again, will be less thick. You can combat this by reducing the milk by two tablespoons. I promise this isn’t a coconut flour oatmeal recipe! 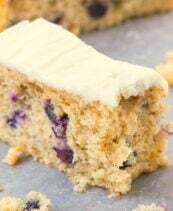 Adding coconut flour enhances the thickness of the oats, and gives it a cake-like, doughy texture. This is great if you choose not to include the protein powder (which will help thicken the oatmeal regardless). Adding protein powder to oatmeal not only gives a huge protein boost but also gives it a creamier, thicker texture. I love using this brown rice protein powder, which is completely plant-based, sugar free and leaves no bitter aftertaste. Other protein powder recommendations can be found here. Add some granulated sweetener to the oatmeal, according to your preferences. I like my oatmeal sweet, so usually add a tablespoon of monk fruit sweetener to it. My protein powder is already pre-sweetened, so one tablespoon is plenty. If you prefer super sweet oatmeal, feel free to add more. Adding ground flaxseed (flax meal) is completely optional. I add it for some extra fiber and healthy fats, and a slightly nutty flavor. Any dairy-free milk of choice is fine, I prefer using coconut milk as I love all things coconut, but almond, cashew, and even soy milk are all great. 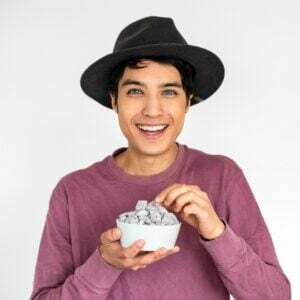 To give it the real ‘Almond Joy’ flavor, add a combination of unsweetened shredded coconut, chopped almonds, and dairy free and vegan chocolate chips. Be sure to reserve half the amount to top the oatmeal with, to ensure you get a delicious combination of all of it with every bite. 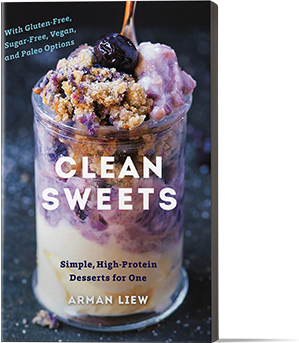 Step 1: In a large cereal bowl or container, add your dry ingredients (rolled oats, coconut flour, ground flax, sweetener), except for your protein powder, and mix well. Step 2: Add your milk of choice and mix well. Stir through your protein powder and whisk very well, to avoid any clumps. If needed, add more milk. Step 3: Stir through half your mix-ins (shredded coconut, chocolate chips, and almonds) and mix once more. Ensure there is at least an inch of milk reserved over the top, as the liquid will be absorbed. Step 4: Several hours later or the next morning, remove oatmeal from the fridge and mix well. Add extra milk if needed and top with the remaining coconut, chocolate chips, and almonds and enjoy! 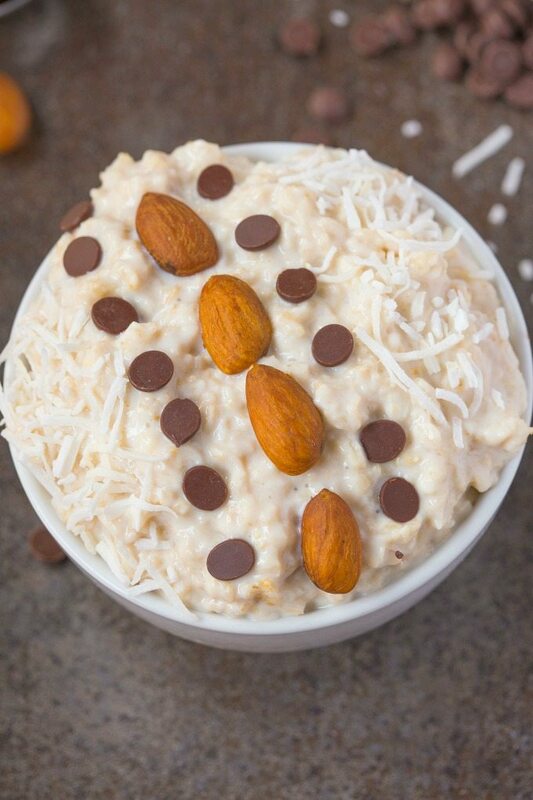 This almond joy oatmeal recipe can easily be made keto-friendly and low carb/paleo. Simply use this keto oatmeal base and prepare it as directed. Stir in the same mix-ins, except use these keto chocolate chips. The next morning, be sure to add extra milk/liquid as the mixture will be thicker than the original overnight oats. Overnight/Refrigerator oatmeal is a fantastic option for a breakfast meal prep. This oatmeal can keep and be stored in the fridge for at least a week, so have a week of breakfasts sorted! Can Almond Joy Overnight Oats be heated? If you choose to enjoy your oatmeal warm instead of cold, be sure to make the following changes. Do not add the protein powder until after the oats have been cooked and absorbed. Stir it in and then adjust the liquids as needed, before heating once more. Only add the chocolate chips into the oatmeal during the cooking process if you want it to be completely melted into it. Otherwise, reserve to simply top the oatmeal with. This healthy, high protein overnight oats recipe has all the best bits of an almond joy candy bar in oatmeal form- Chocolate chips, almonds, and shredded coconut! Naturally vegan, dairy free and gluten free, it's protein packed and with a keto and low carb option! In a cereal bowl or small container, combine your rolled oats, coconut flour, vanilla protein powder, ground flax, sea salt and mix well. Add your milk of choice and mix well. Slowly stir in half your coconut, chocolate chips and almonds and mix well. Add extra milk if needed, and refrigerate. The next morning or several hours later, remove from the fridge. Add extra milk before topping with the rest of the coconut, almonds and chocolate chips. Prepare keto oatmeal base as directed. The next morning, stir in your coconut, almonds, and chocolate and mix well. Add extra milk if needed, and enjoy. 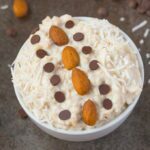 Vegan Gluten Free Almond Joy Overnight Oatmeal (Keto, Paleo Option) can be meal-prepped in advance, and will keep for 1 week. 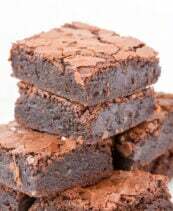 Do you enjoy milk chocolate? I was just thinking about what to make for breakfasts this week and so the timing here was appropriate. I also like all the other options you have. I must’ve missed the snickers one, I’m going to make that next! Love overnight oats when it’s hot outside. Oh yes! You’d love the snickers one, Ellie! I actually NEVER enjoyed almond joys as a kid until I tried your almond joy cookies and then replicated the flavor in my sweet potato kabocha pudding! Now coconut, chocolate and almonds together are the ultimate combo! YES! 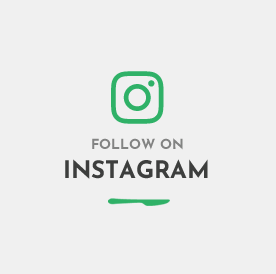 This is such a good combo, I’m so glad you like it! Always. Excuse me as I drool over those sliders. THE RANDOM HUMP hahaha. So real. Almond joys were the grandma candy of my time, but I must admit that I really loved them. And only milk or white chocolate for me; dark chocolate is too bitter for my juvenile taste buds. Are you surprised that Reese’s, Butterfingers, and PayDays are my favorites? ← PEANUTS. OMG. I just googled paydays and OMG PEANUT PERFECTION. I so feel you on how over sweet milk chocolate is. I could never eat it on its own, only with nuts or in bars like these. Dark chocolate though, that’s my jam. Also, I just started adding coconut flour to my oatmeal and it’s freakin amazing. The texture is unreallll. You’ll love it!!! I’m so glad I shared it yonks ago on here, I thought the blog world would hate on me! hahaha love it! Have you tried the 90% or the 99%? It’s SO mortal, but delicious! I remember Almond Joy was my mom’s fave candy bar when I was a kid. I got the red striped candy bar package–Mounds, and she got the blue one. Ah, chocolate bar memories bond us, don’t they? 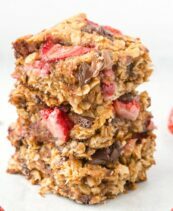 Can you use instant oats for this recipe?